Wix offers a number of great specially designed features designed to help musicians sell and promote their music. This article takes you through some of the main features, including a walk through showing how easy they are to implement on your website. Published: Jan 21, 2016. 14:52 +0100. It is well known that the music industry is tougher than it’s ever been for aspiring artists, and to make it as a full-time musician means more than just being good at your instrument, singing, songwriting, or production. It also means being good at the business side of the music industry. So, just like any new SMB or startup, becoming a professional musician requires planning, hard work, and also an online presence. Why Use a Website Builder to Promote Your Music? Building a website should be one of your first steps when looking to share your music with people and turn professional. Having a website allows you to reach people all over the world with your music, and to have an instant portfolio of work to show to people who might offer you opportunities. You can have all your music in one place, where it can be accessed by almost everyone. A website builder is a very accessible way building your website: it’s cheaper than hiring professional website developer and easier than designing your website from scratch. It’s an excellent option for those who don’t know how to code in HTML or anything else, and who think their only choice is to go to an expensive professional programmer. Remember that if you use a professional developer, any additional changes might mean more service charges, and being reliant on the developer because you lack technical knowledge. When you use a website builder, it will take care of all the complicated programming and coding behind the scenes of your website; you can add elements or drag-and-drop ready-made elements to create your perfect pages. So, you can design a great website without learning anything about CSS or HTML. Wix is a cloud-based development platform for websites, and it is also one of the most popular website builders. Founded back in 2006, it is headquartered in Tel Aviv, Israel, and has offices in New York City, Vilnius and San Francisco among other. It allows its users to create HTML5 websites by using a drag-and-drop tools system which lets you add functionalities like e-commerce, social plug-ins, email marketing and contact forms. They are also built on a freemium model, and this means that when you initially create a website with the Wix website builder, it will be free. After this, you can pay for premium options such as your own domain name, the removal of Wix adverts, e-commerce capabilities so that people can buy things on your website, and buy more bandwidth and data storage. For musicians, Wix offers an excellent service; it has also developed features specifically for those looking to use their online presence for music. The company has integrations with over 120 online music stores and streaming services and gives musicians capability to manage everything from their dashboard. You can sell your music from your website. They offer commission-free music sales of high-quality FLAC and MP3 320kbs and music files, directly from your website. They can distribute your music via iTunes, Apple Music, Google Play, Spotify, Rdio, Deezer and 120 digital music stories. Promote your tours and shows and sell tickets via BandsinTown and Songkick. Use their Press Kit Builder to generate online publicity. Sell merchandise, as you can enable e-commerce capabilities on your website. Website templates which help you create a website that reflects your music. Analytics allow you to see not just page views, but also music sales, streaming and download figures. Selling digital downloads of your music is one of the first ways that you can start making money from it. Of course, your music website is one of the first places they will look. With its commission-free streaming services, they provide the option to sell songs easily from your website. You do this by adding the “Wix Stores” option from the panel on the left-hand side of the editor screen, which you will see further below. Promote your music on various popular websites such as Spotify and Apple Music. To appear on these websites, you must upgrade your website to the Premium Music plan; this package can sync music straight from your website to Apple Music and other music websites. They also often runs novelty promotes such as Opening Act where it promotes musicians on YouTube, so an account with Wix can mean much more exposure. Also, promote your gigs and get ticket sales by using the app, Bandsintown to allow customers to buy tickets for your show. As with all other apps, this is accessible through the “Apps” section in the website editor; it’s also a free feature. It lets you add options to your websites such as commenting, updates and more. You just need to go to the “Apps” part of the Wix editor and choose from the many premium social feature available. This will mean visitors to your website can be part of generating content for it, involving your fans with your music, and making your website look even smarter. Wix has also made many social features freebies with your Wix account. See how your music is doing by looking at the Wix analytics which can tell you all about your sales. License and publish your music using Wix, and so keep ownership of your songs, and earn money from people using them for adverts or even films. Promote yourself with a music blog, which you can make through your website, and have for people to read as they listen to your music. This is a great way of letting people into your musical vision and getting them an interest in buying your music. Go to the Wix website, and make sure you choose the option to create a Music Website. Then, click the “Get Started” button to begin making your perfect website. You can also get to this page by simply going to the main homepage, and choosing the “Get Started” option there: once you’ve got to the website editing stage, you can still choose any of the musician templates, even if you didn’t click the “Music Website” option. Go to the Wix website. © Screenshot. 2. Sign up for free on the signing up page. All you have to do to start getting your music website up and running is enter your email, and a password of your choice; you can also choose to sign up using Facebook or Gmail. This will be the address that they contact you on about your account with them, for upgrades or customer service. You’ll just be asked to retype your email and password, and then you’re ready to move onto the next stage. Sign up for free. © Screenshot. Choose a template. © Screenshot. Click the “Edit” button on a template, and this will bring you to the Wix website editor which you will be using to make your website. At first, this will show you a ready-made template, but you are free to change it in any way you choose to. Click the Edit button on a template. © Screenshot. This takes you to the Editor. Here, the page being worked on is “Music”, but using the navigation in the top left-hand corner, you can also move to all the other pages of your website, such as “Home”. The panel on the left side allows you to add media and change backgrounds. The first thing you want to know is how to upload your music, right? Well, it’s easy. Just go to the “Uploads” option, and as you can see, you can choose “Single Track” to upload a song or piece of music. This takes you to the Editor. © Screenshot. Upload music with the “Single Track” button: this will then allow you to add files from your computer, and so you can choose any track from your recordings, and put it straight on your new website. When you’ve chosen a track, click “Upload” and your track will be instantly placed on your website. It also comes with a track manager, which you can see here; this allows you to keep tabs on the music you’ve uploaded, and easily add or remove tracks. Your track will be inserted into your website, and then the Wix editor will allow you to edit the way it looks on your page, right down to the colors and the placing of the song on your Music page. Your track will be inserted into your website. © Screenshot. Use the same panel to add more website features. Here, you can see how it’s possible to add a gallery of photos or even videos to your website to make a visual presentation which reflects your music. As with uploading music, other media can also be uploaded straight from your computer, and then you can edit the placing of it on your website, and how it appears. Use the same panel to add more website features. © Screenshot. You can also add a blog to your website, and tell people about your music. Wix lets you add this feature to your website, so you don’t have to use another platform for your blog. Add a blog to your website. © Screenshot. Save your website and choose to edit the name of the website. Here, you can also see an option to connect your new music website to a domain name: this is available once you buy a domain name, which you can get as a premium feature. If you’d like to carry on trying out the service for free, then continue with the top option: the free Wix address. Save your website. © Screenshot. Your website is now finished. You can see what a finished Music website looks below. Your website is now finished. © Screenshot. Why Upgrade To A The Wix Premium Music Plan? The free account is ideal for musicians, in particular for those who want to make their first step in having an online presence. But, as it is a freemium business model like we mentioned above, there are some things that only come with upgrading to the Premium Music Plan. This plan has been designed specifically for musicians, and it covers all you would need on a music website: it has a built-in feature which lets your music appear on over 120 music streaming websites, including Apple Music and Spotify. It also allows you to have e-commerce capabilities built into you website, which means you can directly sell music and gig tickets off your website. As you can see, they offer a number of plans for the upgrade. These plans are available to all customers, but the e-commerce option is of particular importance for musicians looking to make a living from their music, for which a website is vital. 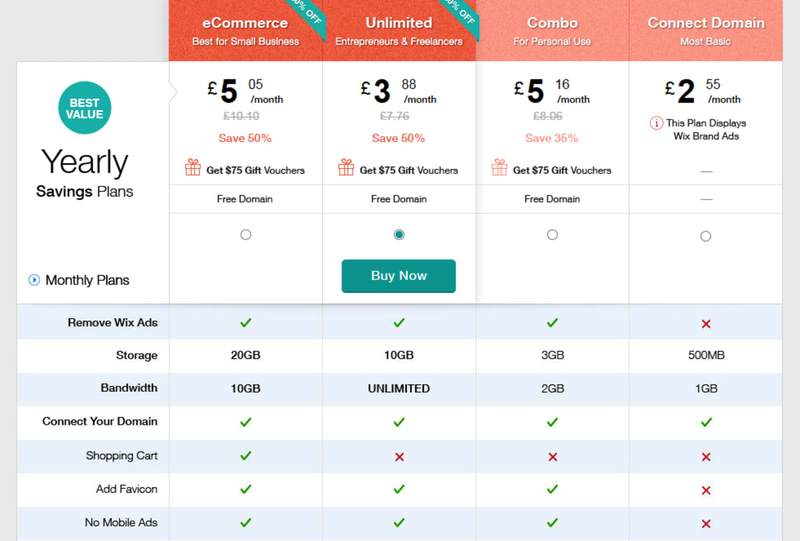 This option will cost £10.10 per month, but as you can see, they offer a 50 percent saving for the first year: it’s advisable, when upgrading, to sign up for at least a year, to get this impressive discount. It’s also important to note that with their e-commerce option, you will be able to accept all main forms of payment on your music website, including Visa and PayPal. Wix is very proud of the musicians who are using their free website builder, and their Premium Music Plan. Musicians from around the world are using Wix to launch and maintain their professional careers, and these musicians have used the service to create websites which function as both a center for their businesses, and also reflect their sound in their presentation and visuals. Rebecca Roundman is the frontwoman of a jazz outfit based in the Bay Area, called Dirty Cello. Dirty Cello’s website includes some great features like video embeds, a page where visitors can buy recordings with their PayPal accounts, and a page where visitors can see upcoming shows and buy tickets. Mark Franklin, in Oxford, in the UK, is a drummer and vocalist for his band, called Black Hats. The Black Hats website is linked to their very own domain name and reflects the look of their music. Nadine Furer, in London, UK, is a singer-songwriter originally from Switzerland. She has used her website to build up a fan following, which she hopes will make her first EP a hit record. The website builder has a lot of useful features and is an easier start for those who aren’t confident using HTML5 coding or CSS to build their own websites, but who don’t want to pay for a professional designer. Though website builders do lack the total control that more sophisticated platforms can offer with website designing, they do allow these less experienced people to make their own online presence. Musicians, whose primary focus is, of course, their music, might find that website builders such as Wix offer a good beginning in the world of internet exposure, and, therefore, help them to find a footing doing what they enjoy.